There are around 40 species of toucan, ranging in weight from 5 to 20 ounces. Any bird in this distinctive feathered family is easily identifiable by its colorful plumage and large, thick bill, which can be more than half the size of the rest of its body. 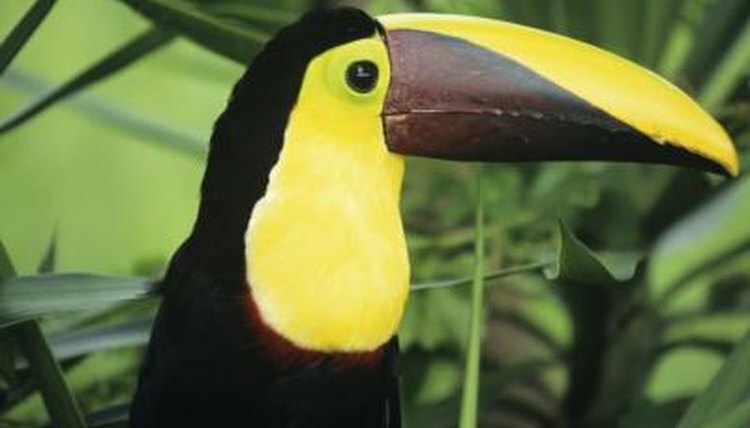 Toucans live in the rainforests of tropical and subtropical regions of Central and South America. They have small wings and don't fly very well, so they're ideally suited to living in rainforest canopies, where they can find plenty of food and shelter without having to fly far or often or come down to the ground. The brightly colored rainforest canopy also offers them a certain degree of camouflage. The majority of a toucan's diet is made up of fruit. In fact, toucans eat around 95 percent forest fruits, such as figs, guavas and palm fruits. After eating the fruit, they regurgitate the seeds, which helps to spread fruit trees around the forest. When fresh fruit isn't so readily available, they'll also eat insects, lizards, small mammals, tree frogs, eggs from the nests of other birds and even the occasional fish. Toucans are social birds who like to live in flocks. These are usually small flocks of no more than six members, but some species live in flocks of up to 12. They're noisy birds who use vocalizations to communicate with one another. They have different calls they use for various reasons, such as warnings, mating or calling to their chicks. They use their bills to intimidate predators and birds who might want to take their territory. However, their bills aren't really strong enough to fight with. Male toucans use their bills to attract mates for breeding season. They bring the female with whom they wish to mate a piece of food, and occasionally the pair will throw it back and forth between their bills as a mating ritual. Females lay between two and four eggs in nests made in holes in trees. Once the eggs have hatched, the mother and father will take turns bringing food to the chicks. It's thought that pairs of toucans are entirely monogamous, at least during the breeding season.